Greetings again from the darkness. Co-directors Sebastian Junger and Nick Quested previously collaborated on a trilogy focusing on the Afghanistan War, including the Oscar nominated Restrepo (2010). Mr. Junger is also a best-selling author and Mr. Quested (a producer) is an Emmy winner. This time out they focus on the Syrian War, the plight of refugees, and the role of West in creating ISIS. 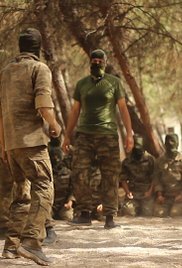 This is a National Geographic sponsored documentary, and though it’s a bit overly politicized, it’s also an extremely well made, detailed, and informative overview for those looking to catch up on the past seven years in Syria. Some of the front line video is stunning and affecting in its clarity of atrocities. In addition to the clips, pointed interviews with a mixture of types provide information and insight that we might otherwise misinterpret or remain oblivious to. Activists, journalists, refugees, politicians (including the recently dismissed National Security Adviser Michael Flynn) and soldiers all offer perspective on a situation that is difficult for most of us to comprehend. Understanding the political strategy of President Bashar Al-Assad clarifies what to outsiders made little sense. Rather than allow the reform movement to gain traction, he instigated and encouraged the Civil War within his country – with the plan to have the military crush the uprising and gain power. The decision is difficult to swallow … the leader of a country choosing to slaughter his own people. It also led to what’s known as the Free Syrian Army – a confluence of various groups of citizen militias. Ensuring this plays like a real life horror film, we see ISIS recruitment videos. These are brutally explicit propaganda with extraordinarily high production value. Beheadings, public hangings and other torture are presented in a manner designed to give hope and power to those who have little hope. It’s terrifying. We follow the story of brothers Radwan and Marwan and their families as they struggle to survive and escape. It seems to be a call to action for those opposed to accepting Syrian refugees, especially when combined with the filmmakers’ finger-pointing at the U.S. for political decisions that (they argue) led to the strengthening of ISIS. There is also an emphasis on President Obama’s infamous “red line” statement, on which he reneged on his promise to act if chemical weapons were used. It is fascinating to hear a portion of an interview with Anna Erelle, author of “In the Skin of a Jihadist”. She’s a journalist who risked her life going undercover, and probably deserves her own documentary – though it’s doubtful she wishes to lose what’s left of her privacy. It’s said that a radical movement is formed out of desperation, and with half of the Syrian population displaced, and more than 400,000 dead, desperation seems an understatement. The film is probably the best yet in its depiction of what has happened, but watch out for those puddles of finger-pointing. This entry was posted on Tuesday, June 6th, 2017 at 8:51 pm and is filed under Documentary. You can follow any responses to this entry through the RSS 2.0 feed. You can leave a response, or trackback from your own site. I must add this movie on my “to get” and “to watch” lists. The Syrian war and of course the rise of ISIS is history, no escaping that, however getting a perspective like that which you outlined makes it that much more of a must see, certainly for me. Thanks for your review; you know by now how I value them.